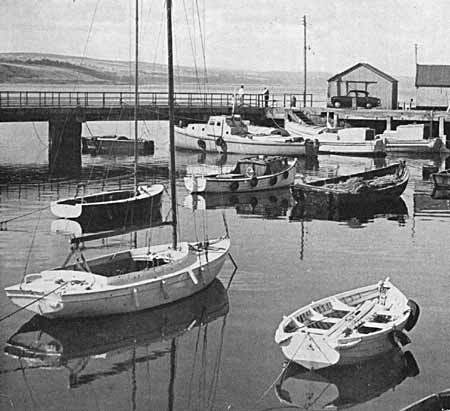 This picture is used with the kind permission of Scottish Field, which used it in their article 'Cromarty, the Forgotten Town' by G. Allan Little, in their March 1970 issue. If I recall correctly, the small motorboat in the middle of the picture with the black fenders was owned by Violet Russell's husband. They lived in the small cottage on Shore Street now occupied by Les Smith. The Enterprise and Endeavour are the furthest away, and next to them a boat we bought in the mid 1960s, but by 1968 the post office contract was closed because of the reorganisation of the Black Isle mail service. Previously it went to Invergordon and on to the HTPO - a sorting carriage on a train. The National 18 Sailing Dinghy with the dark hull and white deck, on the left behind the white yacht belonged to me. It was built originally by the famous yachtsman and boat builder Uffa Fox. It's number was 18/49. The motor boat in front of my National 18 was owned by Willie Ross.